Looks like the winter is counting its final days now.. It was raining here from past two weeks. Due to rain, our bird friends were not able to go in search of their food it seems..they were spending all the day in our balcony! For me, it was a nice company with these pigeons and colorful parrots :) Now, the rain has stopped and the birds are back to work! But they will give a guest appearance at-least twice a day! Today's posting is a simple but special item which I learned from my sister. This is a kind of bread spread, i.e., peanut butter! It goes well with Parathas also. Roast the peanuts on medium flame and allow to cool. Remove the outer skin of peanuts. 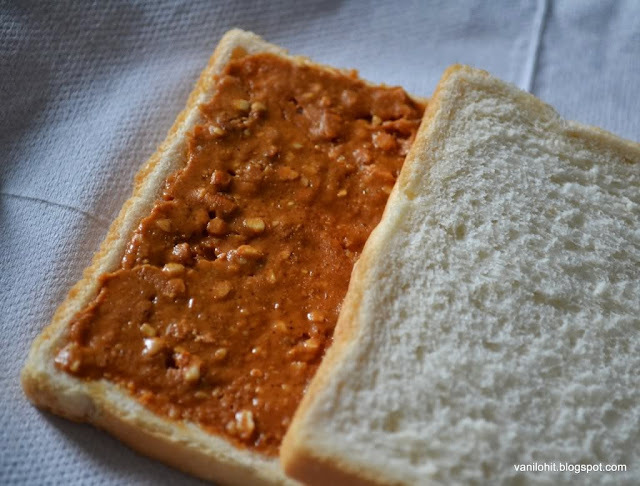 Grind the peanuts and sugar in a mixie jar into fine paste without adding any water. Transfer it to an air tight container. You can preserve it for 1 - 2 months. 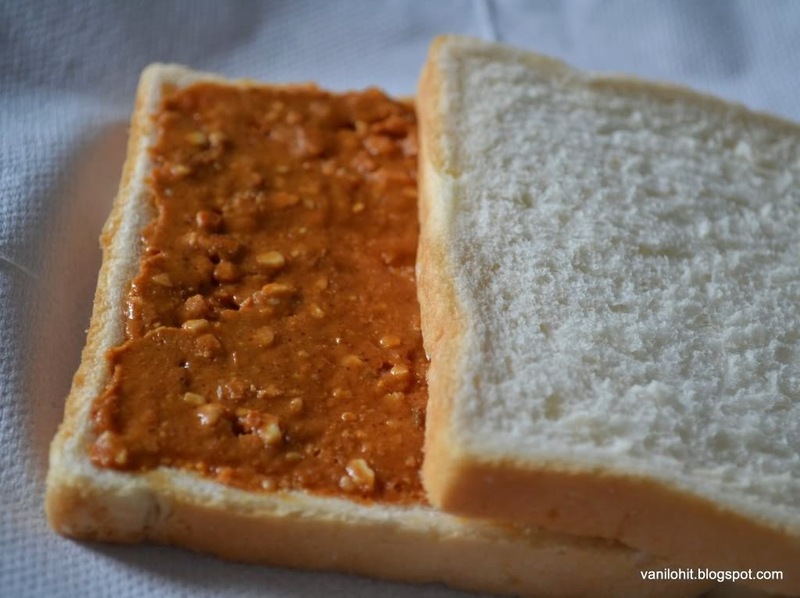 If you like to prepare crunchy peanut butter, coarsely grind 2 - 3 spoons of peanut and add it to the fine peanut butter. 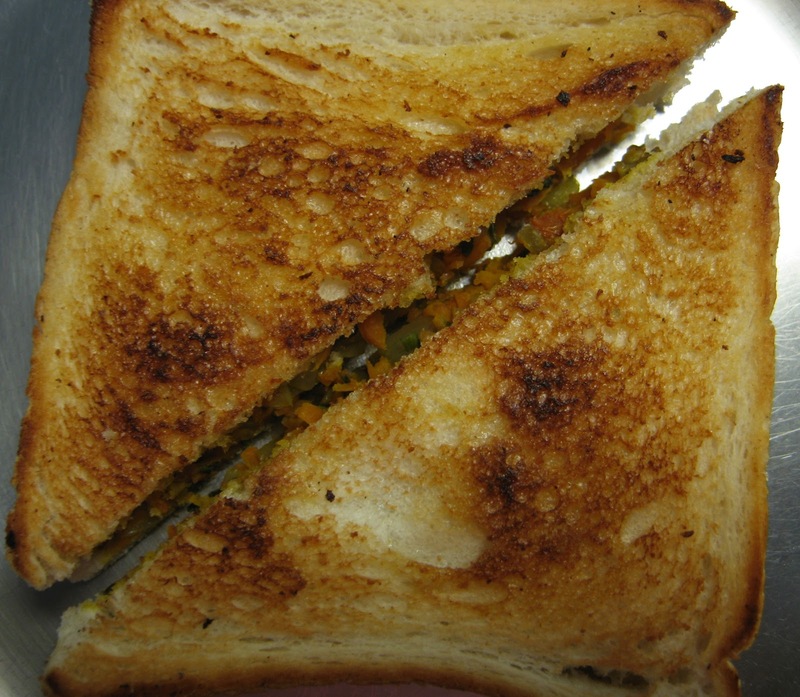 I prefer this sandwich for breakfast or as snack while going for some picnic or tour. The reason is simple.. we can prepare it previous night itself so that there will be no worry about the morning breakfast! This recipe is from a Kannada magazine which I came across couple of years back. Heat oil in a pan, add cumin seeds, turmeric and chopped green chillies. Then, add ginger-garlic paste and saute until the raw smell is gone. Add chopped tomato and saute for 2 - 3 minutes. 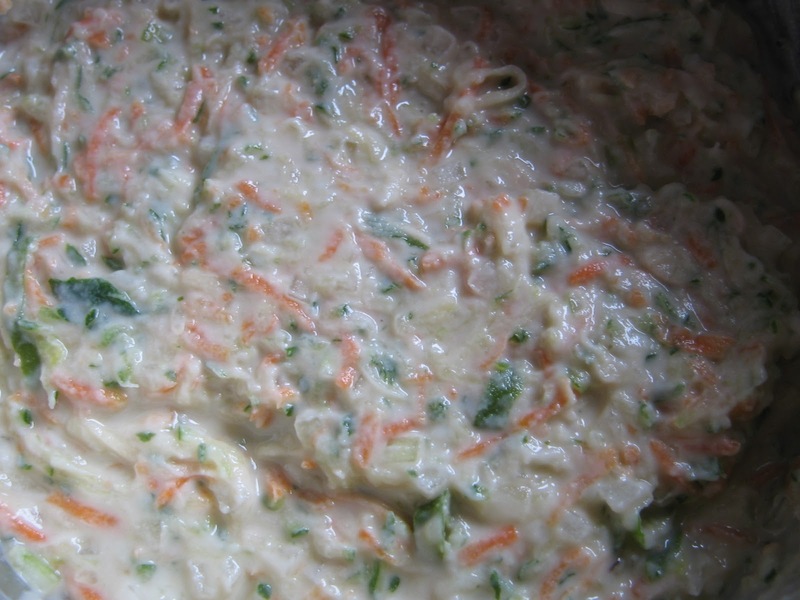 Add the chopped onion and grated carrot, cook the mixture on medium flame. Cover it half with a lid. Once its cooked half - way, add chopped coriander, curry leaves and salt. Mix it well and check the taste. Most of the water content will be evaporated by the time its cooked nicely. Add few drops of lime juice to the cooked mixture and remove from flame. Allow it to cool down for few minutes. Spread the carrot mixture on the roasted side of the bread and put one more bread upon it so that both the roasted sides will be touching the mixture. Roast the outer side of both the bread slices nicely and cut it across. You can have them immediately or preserve for next day also! 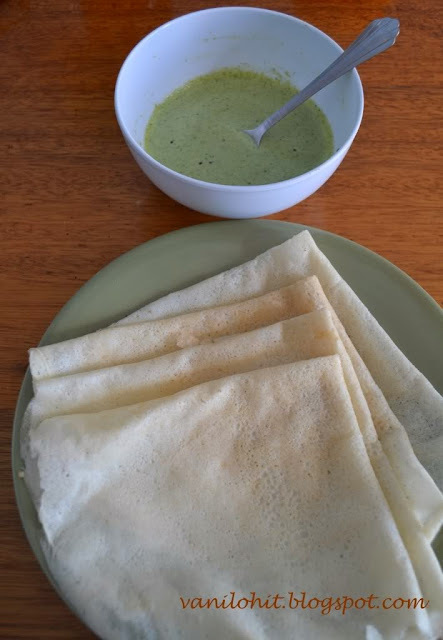 This dosa is very easy to prepare and the batter won't need any fermentation to be done. 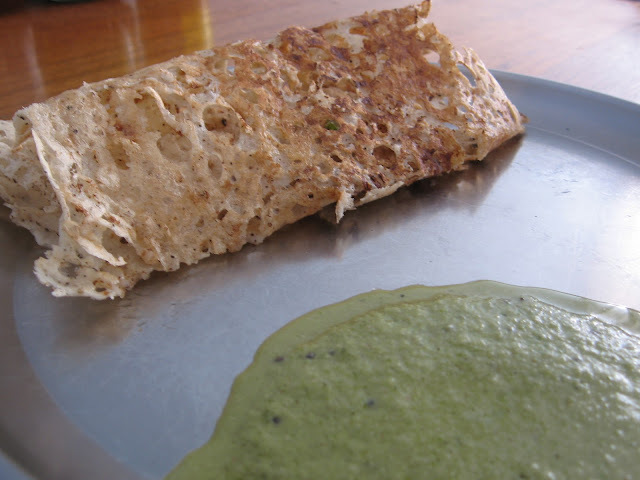 Try it once, you will love this dosa! Soak the rice and fenugreek seeds in water for 3 - 4 hours or overnight. Grind the red chillies, grated coconut and chopped tomatoes in the mixer. Then, add the soaked rice and fenugreek seeds to this and prepare a fine batter. Add salt to the batter and mix it well. Heat the tava and prepare thin dosas. Serve hot with chutney. 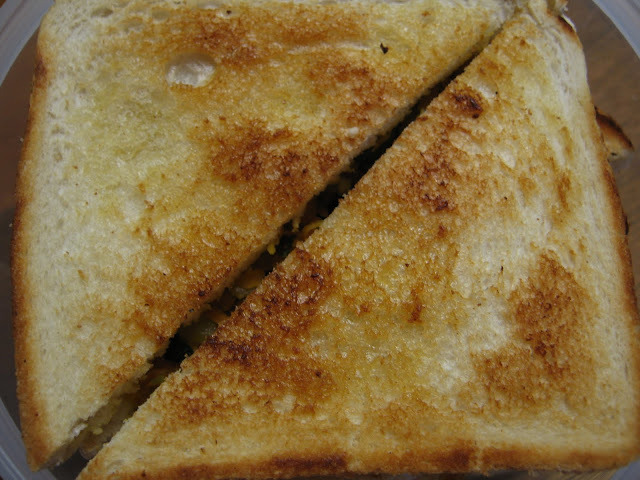 Sending this over to the August - 2011 Contest of Manjula's Kitchen. For typical Havyaka kind of sambar, coconut and roasted spices (or curry powder) will be ground into a fine paste and will be added to the cooked dal and veggies. 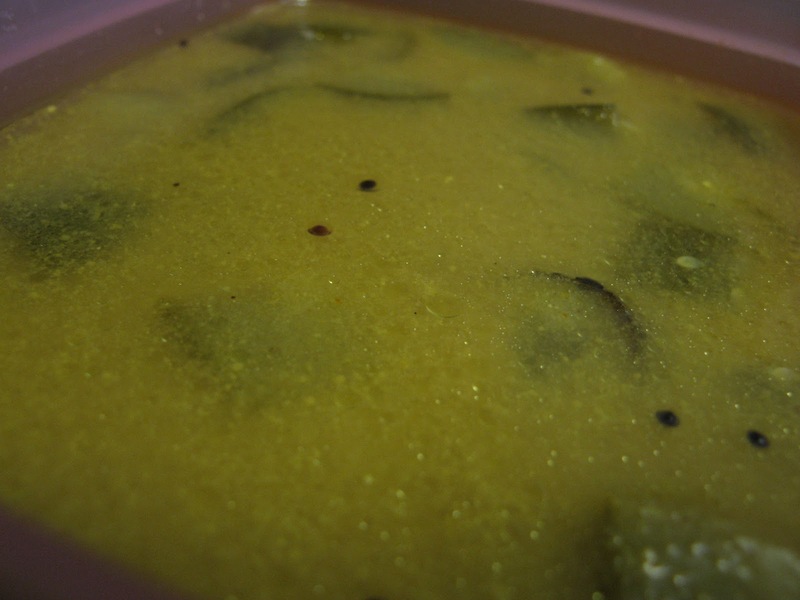 You can use different varieties of vegetables for preparing this type of sambar. Chop the vegetables and cook them in a pressure cooker along with washed dal, 3 - 4 drops of oil, turmeric and sufficient water. After 3 whistles, switch off the flame. 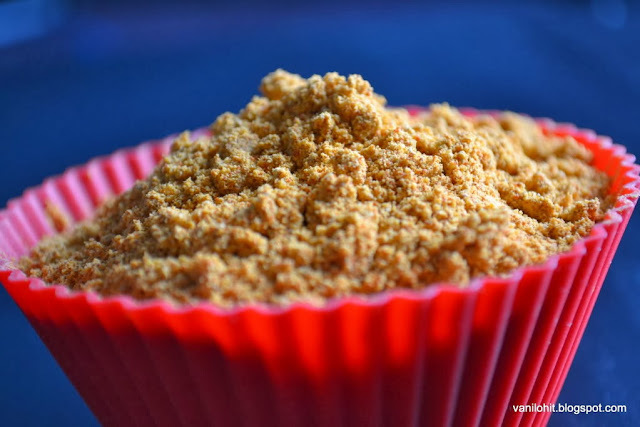 Grind the coconut, sambar powder and tamarind into fine paste. Pour the masala paste, cooked dal and vegetables into a vessel and allow it to boil. Add salt, sugar/jaggery and some water, to adjust the consistency. Once it starts boiling, add few curry leaves. Also add chopped coriander if you like to do so. Allow it to boil for 4 - 5 minutes and remove from the flame. 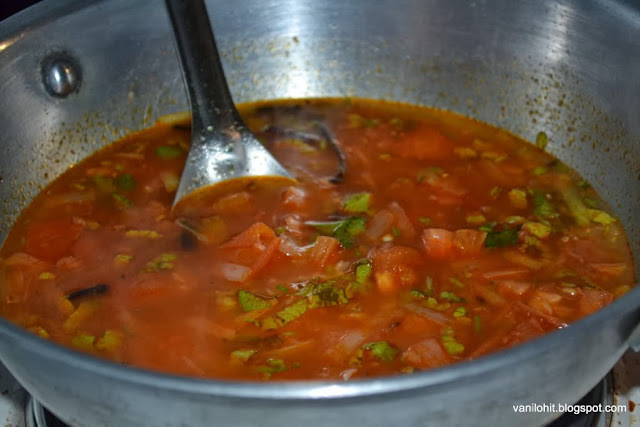 If you are using veggies like potato or beetroot for this kind of sambar, add some chopped onion while the sambar is boiling. It will give a nice aroma and doubles the taste of sambar. Add 1 - 2 drops of oil to the heated pan and roast all the above ingredients except curry leaves and chilly powder. Once they are roasted, add the curry leaves and allow the ingredients to get cool down. Transfer them to the mixie jar and prepare a fine powder. Roast the chilly powder for 2 - 3 minutes by adding few drops of oil. Mix the chilli powder with sambar powder and store it in an airtight container. 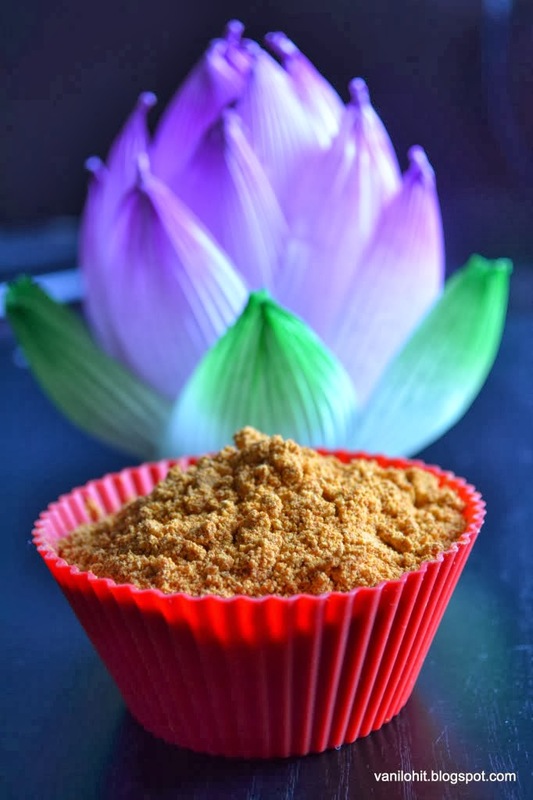 Use the asafoetida generously to increase the aroma of sambar powder. You can change the measurements given above to get different taste. Chop the onion and green chillies and keep aside. 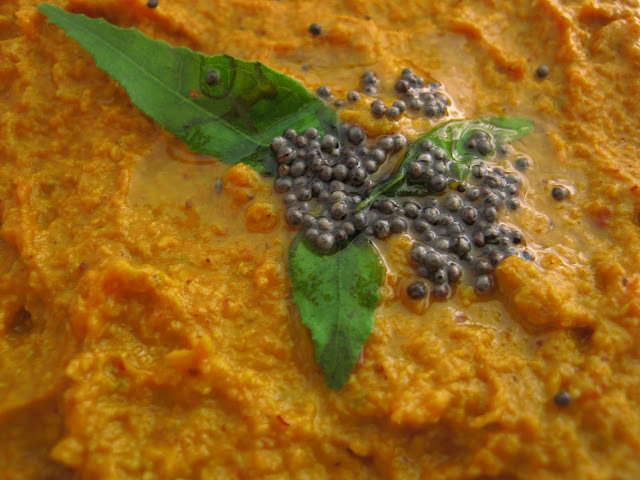 Heat the oil in a pan, add urad dal, mustard seeds and turmeric. Once they splutter, add green chillies, curry leaves, and then, cabbage. Close the lid and cook for 2 - 3 minutes. 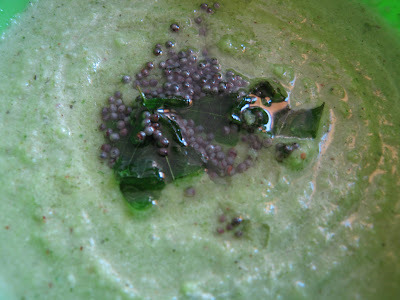 Then, add the soaked green gram and salt. If you want, you can add little sugar. Close the lid and allow to cook. When its almost done, add chopped onion. Cook it for 3 - 4 minutes and remove from flame. Finally, add the lime squeeze and mix well. It goes well with rice, roti or chapathi and dosa. Most of the days, our dinner will be accompanied by some or the other kind of roti or chapathi. I will keep on trying some or the other variations in doing them. 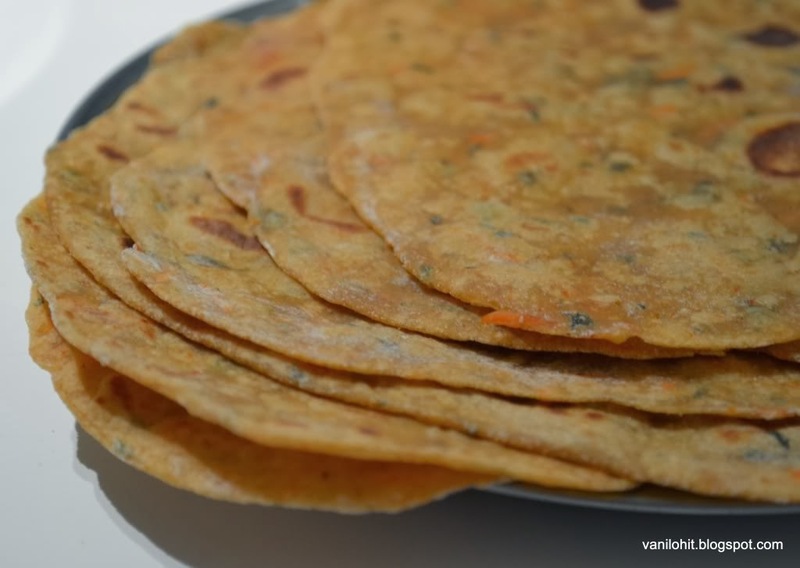 Here is a version of Carrot Rotti, which is the result of my experiments in the kitchen. It suits for breakfast as well as for the lunch box. If you find it difficult to prepare it in the morning, you can keep them ready by previous night itself. 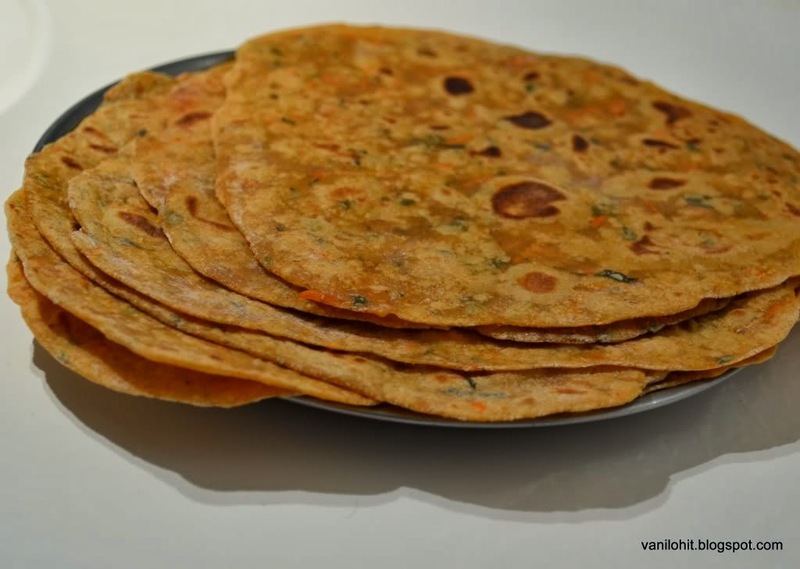 You can prepare 8 - 9 rotis with the measurements given here. 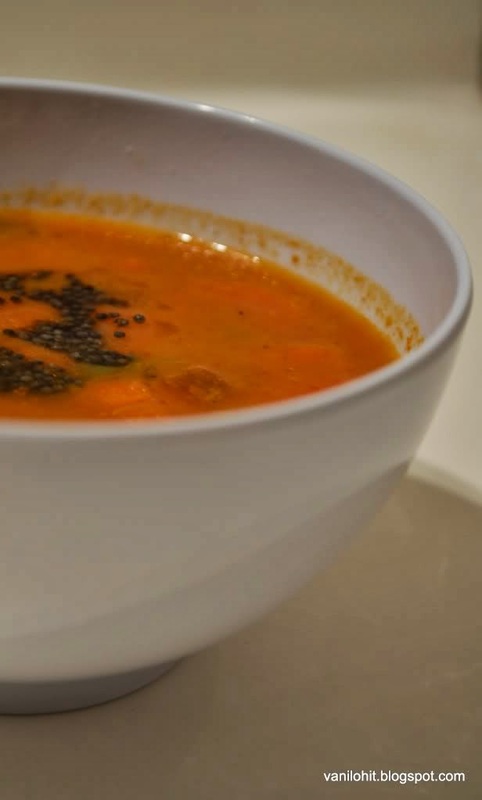 In a vessel, combine the wheat flour, salt, amchur powder, red chilly powder, kasoori methi and grated carrot. Add 2 - 3 spoons of oil to this dough and knead it. Let it rest for 10 minutes. Make lemon size balls from the dough and roll them into small circles. Apply little oil and fold them. Again, apply some oil and fold them into triangles. Use some dry flour and roll these triangles into chapathi shape. Heat the tava and transfer the rolled chapathis one by one. If you want, you can apply few drops of oil while cooking them. Once the chapathi is done on both the sides, remove it from the tava and serve hot with your kind of side dish. Are you the fan of Pani puri like me? 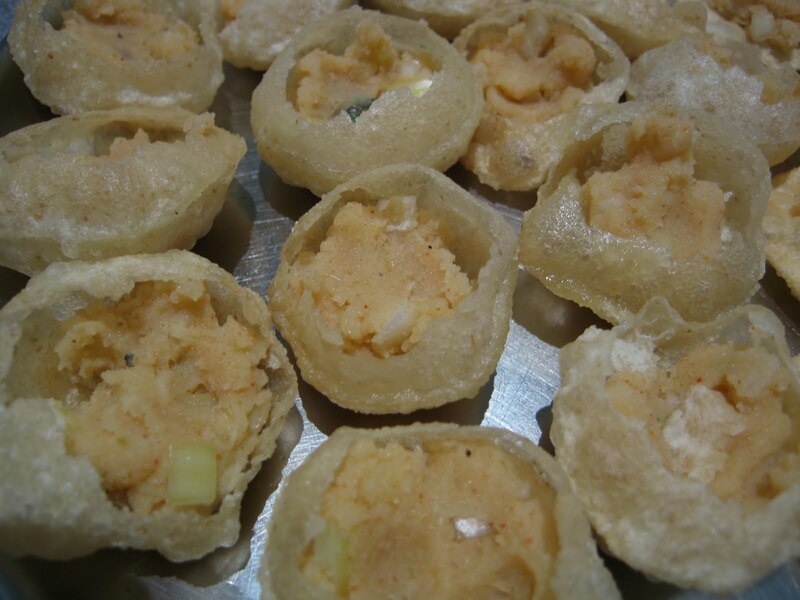 Here is the recipe for preparing tasty pani puri at home..
Dry roast the cumin seeds and pepper, and make fine powder. If you are using the crystallized salt, roast them littlebit. Grind the coriander leaves, mint leaves, raw tamarind and green chillies in a mixer, by adding enough water. Filter the grind paste using a tea filter. Add required quantity of water to this filtered water (Pani). Add cumin-pepper powder, salt and lemon juice to the prepared Pani and adjust the taste. Boil the potato, and mash them nicely. 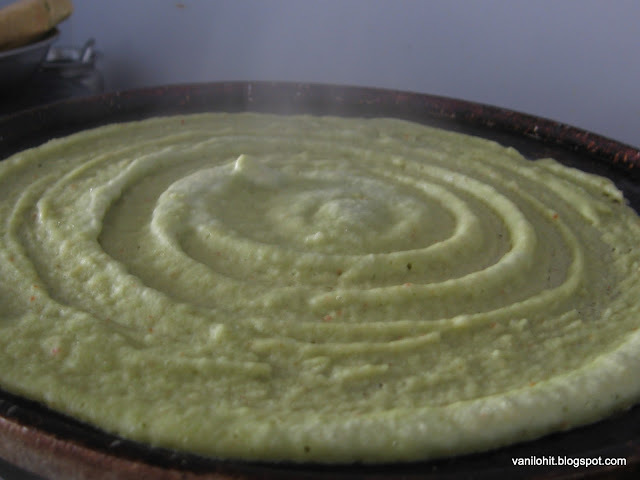 Take the mashed potato, add the chopped onion, coriander leaves, red chilly powder, pepper powder, salt and amchur powder. Mix it well. Now, both Pani and Aloo stuffing are ready. What we need to do is we need to fill these things in small pooris called Gol gappa. Take a Gol gappa and make a hole with your finger. Fill the Gol gappa with Aloo mixture upto half, fill the remaining portion with Pani. 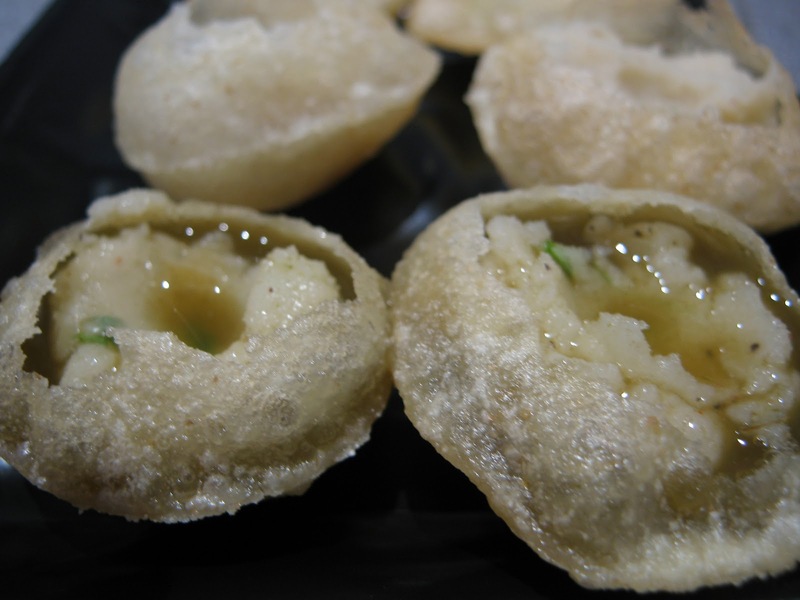 Enjoy the home made Pani puri with your family! Up to these days, we were hearing from our relatives in India that they are enjoying the season with varieties of mangoes. We were really feeling sad about not getting the mangoes here.. Now, the time has come for us to enjoy the mangoes! Mexican mangoes are available in the grocery stores these days. 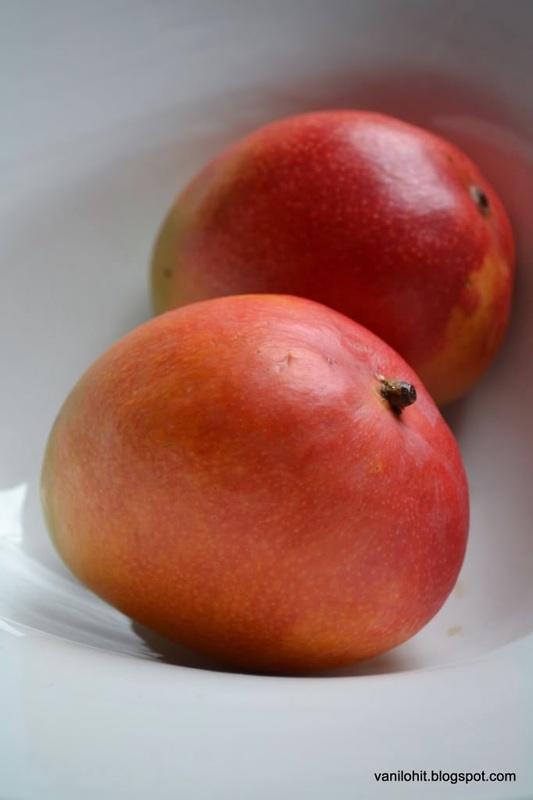 Already I prepared few varieties with mangoes, but one thing which is in my mind is mango ice-cream! Even though it is winter, I am sure, I will prepare the mango ice-cream soon. 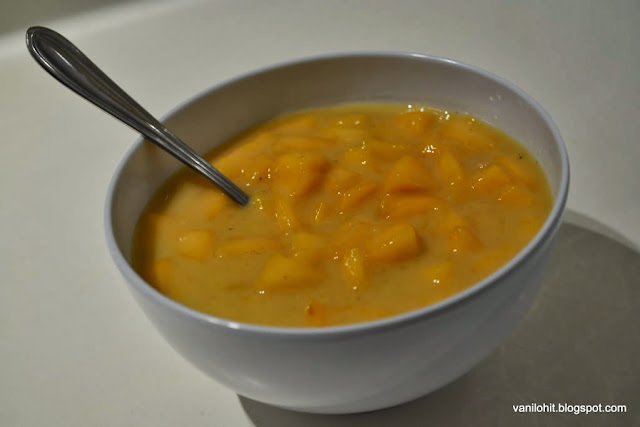 Here is the delicious Mango Seekarane recipe for you. Hardly, it will take 20 - 30 minutes for you to prepare. If you have mangoes at home, you can prepare it anytime! 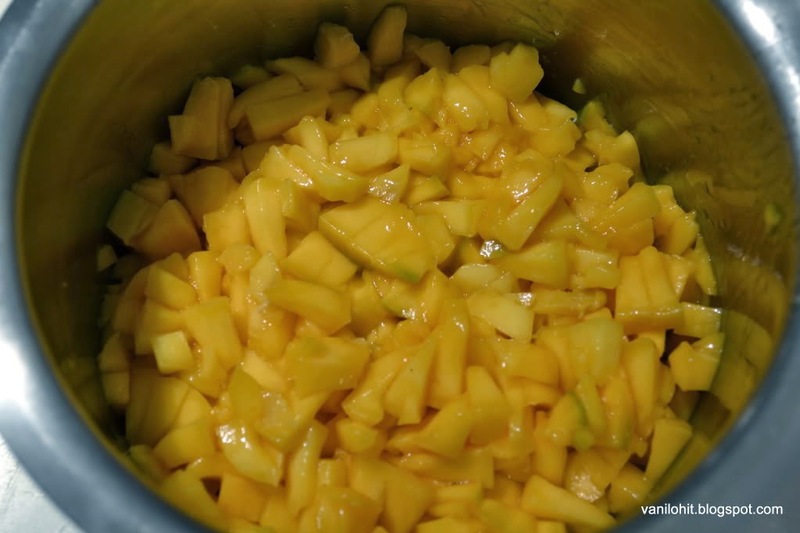 Clean the mangoes, remove the peel and chop them finely. If you are using the coconut, grind it in mixer into fine paste. Else, take 1/2 cup of chopped mango, grind in the mixer for a while and prepare the pulp. 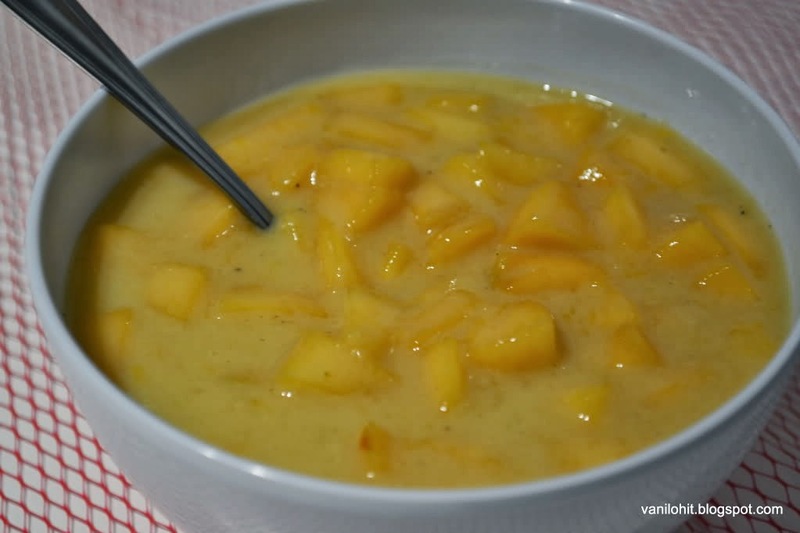 Mix the chopped mango, sugar / jaggary, salt, milk and grind mixture in a vessel. Finally, add the cardamom powder. Simply, you can serve it as a dessert. It is a good combo with chapathi, poori and even dosa. Cut tomatoes, red chillies and keep aside. Slice the onion thinly. Heat oil in a pan, add cloves, cardamom and cinnamon pieces. Fry them for 1 minute and add cumin seeds, turmeric, ginger-garlic paste, followed by green chillies. Saute them for 1 - 2 minutes, and add tomato pieces, sliced onion and chilly powder. Cook them for few minutes until tomato pieces become smooth. You can add little salt to cook them fast. 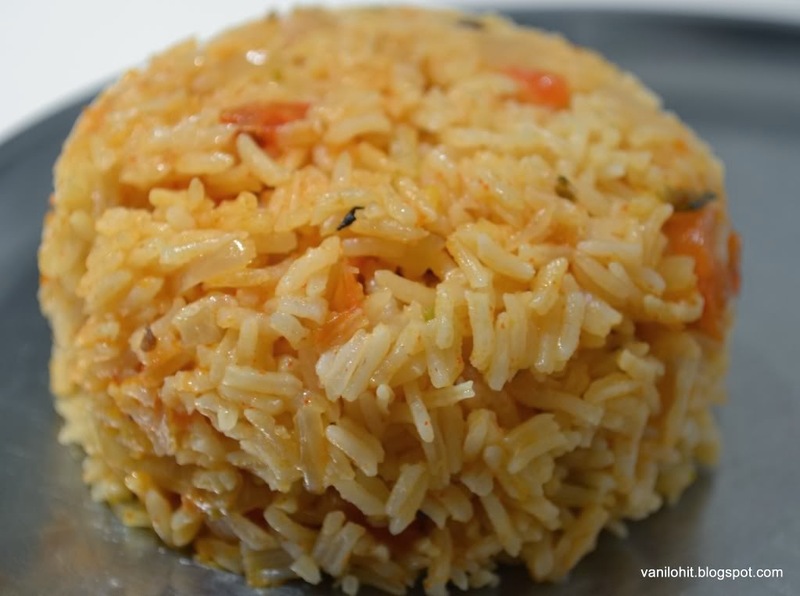 Add the rice (cleanly washed in water) and required quantity of water to cook them. I have added 2 3/4 cup of water here.. it depends on the type of rice you are using. Add salt, lime juice and chopped coriander leaves and adjust the taste. Cook this mixture in pressure cooker or rice cooker. You can add roasted cashew pieces once they are done. Serve the warm tomato rice with Raita or simply curd. One important thing to be noted is that, be careful while adding the chilly powder. If you add little more also, it will become too spicy. Mix the all purp flour, rava and salt in a vessel. Add water little by little and prepare the dough. Better if it is harder than chapathi dough. Cover this dough with a wet cloth and let it rest for 30 minutes. 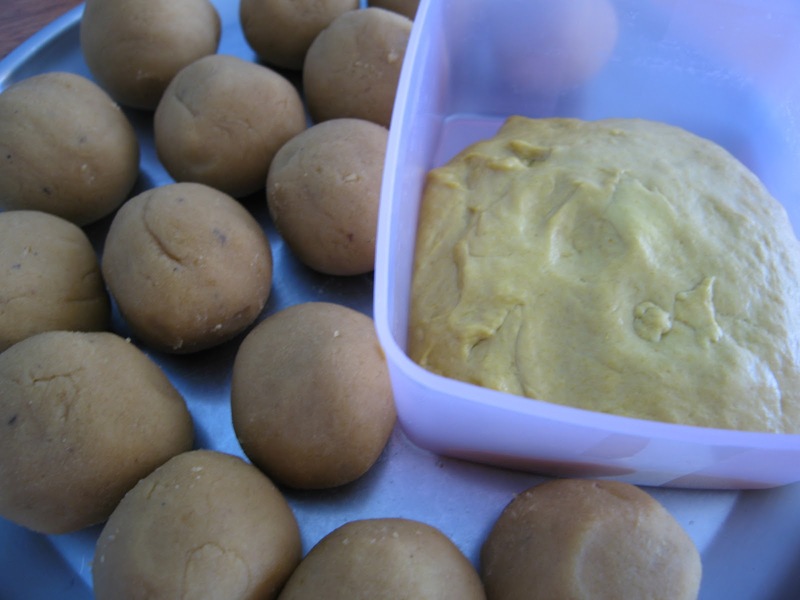 Prepare lemon size balls from the dough and roll them like chapathi. You can use some dry flour if required. 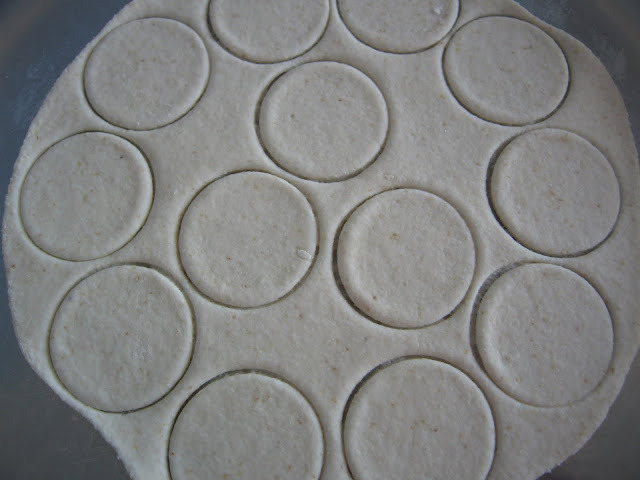 Take a small round shape cutter (I used the cap of milk can here) and cut the chapathi into small round pooris. Repeat this step until all the dough is finished. Cover these pooris with a plate so that they will not get dried out. Deep fry these pooris in medium flame till they they are slightly golden brown in color. Leave the deep fried pooris on a tissue paper for sometime. Transfer them to an air tight container once they are cool. Note: While deep frying, some pooris will puff up and some of them will become flat. 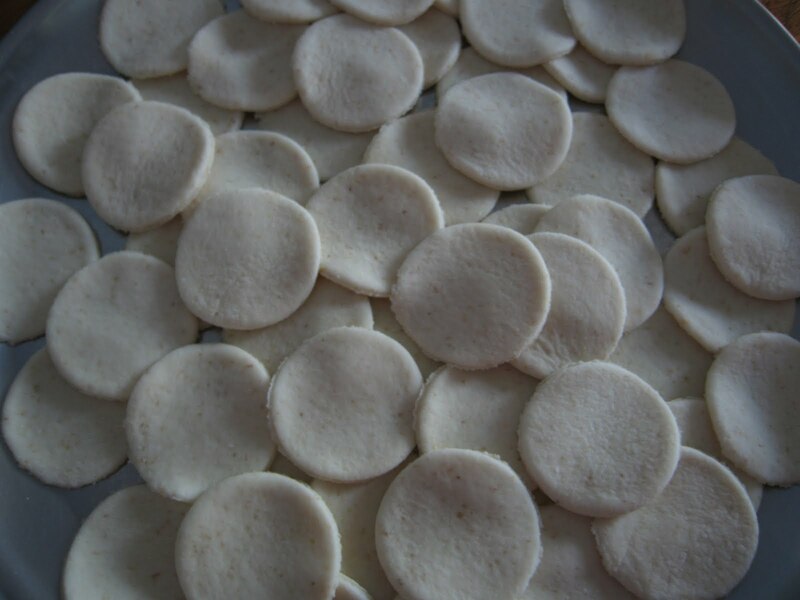 You can use these flat pooris for preparing Tikki poori, Bhel puri, etc. 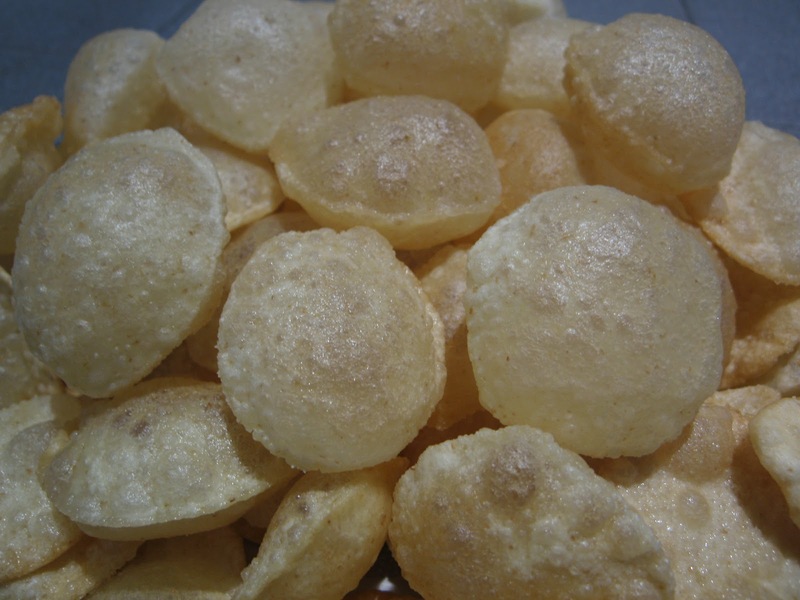 Puffed pooris will be useful for preparing Pani poori, Dahi poori, etc. 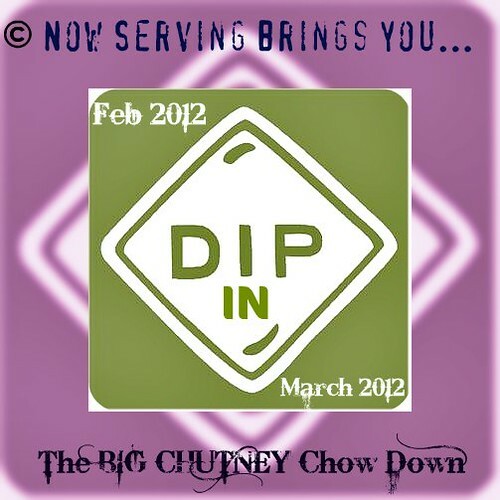 Here is one more addition to the list of Chutneys. 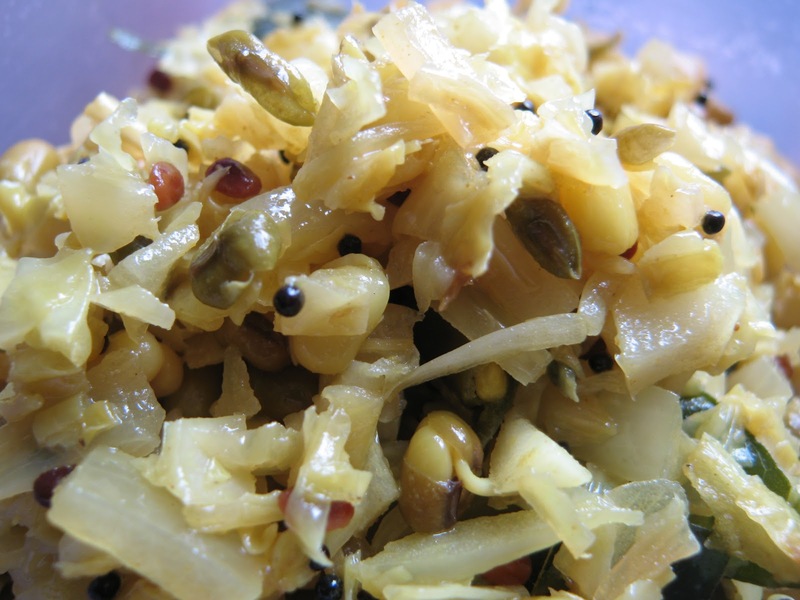 Normally, what we do is we will repeat only few varieties of chutney or other side dishes most of the times. Day-by-day, we ourselves will get bored with these routine things. So, I feel that it is always better to keep on adding new things to our collection. Traditional Havyaka style of food requires lot of coconut. I will prepare some varieties of food which won't taste good if we won't add coconut. So, I will keep a stock of shredded coconut in my freezer. Last week, we bought one coconut from a store nearby. But it was spoiled and we ended up in throwing it to the dustbin. After 2-3 days, again I went for buying the coconut. I bought it from a different shop this time. For my bad luck, it was also spoiled! So, buying coconut has become a big challenge for us these days. This chutney is from my sister's collection of recipes. Of course, lot of credit I need to give to her since so many varieties I learned from her. This goes well with dosa, idli and chapathi. Cut the onion lengthwise into 2 equal parts without removing its outer skin. Take a small pan for seasoning and heat 1 spoon of oil. Add the onion pieces and whole green chillies and close the pan with a plate/lid. After 3 - 4 minutes, open the lid and turn the onion pieces into other side. After another 4 - 5 minutes, remove it from the flame and let it cool down for few minutes. Once they become cool, remove the outer skin of onion pieces and cut the onion into small pieces. Grind the onion pieces and green chillies with grated coconut into coarse paste. Add salt as per taste and do the seasoning with oil and mustard seeds. Now, the chutney is ready to serve. I learned this recipe from Suvarna channel cookery show, hosted by Sihikahi Chandru. I have made few modifications for my convenience. You feel the taste similar to curries which we get in hotels. This gravy goes well with roti, chapathi, naan, etc. Grind the cashew nuts, elachi, ginger, garlic, cumin seeds, fennel seeds and red chillies into fine paste. Cut the potato into medium size cubes and make holes with a fork from all sides. It will help to cook them easily. Heat the oil in a pan and deep fry the potato cubes. Once they are done, keep them ready in a bowl. Heat 2 spoons of oil in a pan, add cumin seeds, followed by masala paste. Add little water and leave it for a while until the raw smell is gone. Then, add the potato cubes, garam masala powder, kasoori methi, honey, chopped coriander and salt. Allow it to boil for 4 - 5 minutes and remove from the flame. 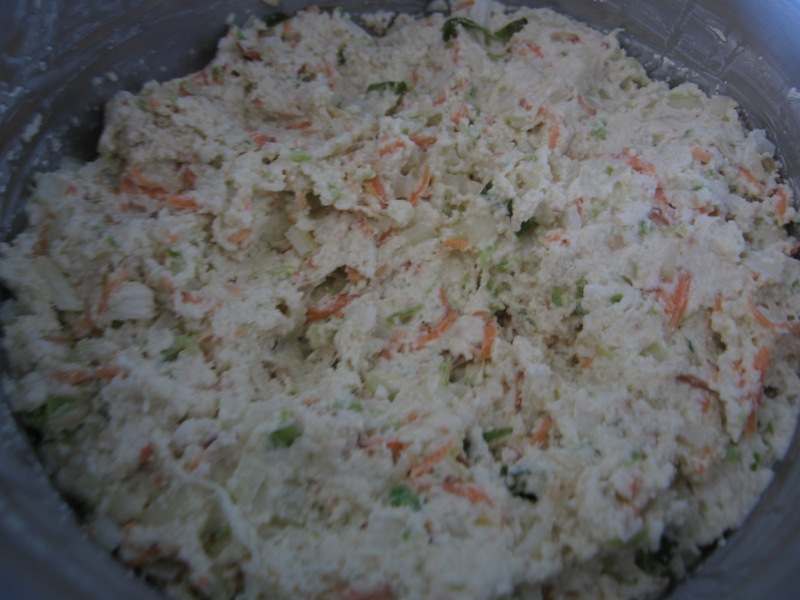 Here is a side dish, which is a good combination with rice. We both i.e. me n hubby, like these kind of side dishes very much. So, I will prepare some or the other kind of gojju frequently. For working women and also for bachelors, it will reduce the burden of cooking a little bit, since you can store and use them for couple of days. You can use this carrot gojju upto a week if you keep it in the fridge. Finely chop the carrot into small pieces. Heat 1 spoon of oil in a pan. Add red chilly, urad dal, few mustard seeds, asafoetida, and turmeric. Once it splutters, add the green chillies. Saute for a while, and add the chopped carrot. Add little water, close the lid and cook it until the carrot pieces become smooth. Grind the cooked carrot along with grated coconut, salt and tamarind into a coarse paste. Don't add too much water, it should be thick. Do the seasoning with oil and mustard seeds and serve with rice and curd. This is a traditional sweet dish, normally prepared in festivals and other celebrations. 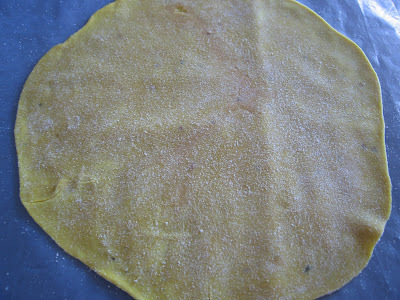 Holige will be in yellow color, looks almost like a chapathi, but sweetish in taste with very very smooth and delicate texture. Even though it is bit difficult to prepare and time consuming, you will forget all the stress while eating the Holige..
Take 1 cup of all purp.flour, add turmeric and pinch of salt and mix it with your hands. Add around 1/4 cup of water to the flour and mix well. To this sticky dough, add 5 tbsp or little more oil and mix thoroughly. Now, the dough should be very smooth, but it will not stick to your hands. Keep this dough covered with a wet cloth for 2 - 3 hours. Pressure cook the Chana dal with enough water and pinch of salt. Allow it to cool down for few minutes. Then, drain all the water from chana dal. Grind cooked chana dal with jaggary / sugar and pinch of salt into smooth paste. Holige tastes very nice if you add both sugar and jaggary for giving the sweetness. After grinding, check the taste and add some sugar, if required. Add the elachi powder and mix it nicely. Put this mixture in a microwavable vessel and heat it in the microwave oven for 2 - 3 minutes. Take it out, mix well, again heat it in microwave oven for 2 - 3 minutes. Continue this procedure 4 - 5 times until you get the consistency to make balls out of it. If you are not using the oven, put the grind paste in a heavy bottom vessel and keep stirring the mixture under medium flame. Once you get a thick consistency to prepare the balls, remove it from the flame. Prepare small lemon size balls from the Hoorana, which we prepared now. Prepare equal number of bit smaller balls from the Kanaka, which we prepared already. Cover the bigger balls with smaller ones, flatten it and roll carefully like a chapathi. Put the rolled Holige on the heated dosa pan. Once you find golden brown marks on both the sides, take it out and allow to cool. Enjoy the Holige with sugar syrup and clarified butter or ghee. You can prepare 15 - 16 Holige from the given measurement. This is my sister's way of preparing rasam. Easy to prepare, and it will awake your taste buds! Finely chop 1 tbsp tomato and keep it aside. Chop the remaining tomato into big pieces. Pressure cook them along with moong dal, pinch of turmeric and 2 - 3 drops of oil, by adding enough water. After 1 whistle, switch off the flame and allow it to cool down. Grind this dal mixture in mixie for 1/2 minute into smooth paste. You can add 1 tbsp of grated coconut while grinding, if you want. Heat oil in a pan, add the dry red chilly, mustard seeds, cumin seeds, asafoetida and turmeric. Once it splutters, add the finely chopped tomato and saute for a while until it becomes smooth. 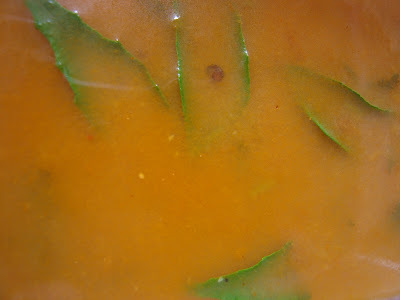 Then, add the rasam powder or sambar powder and the ground mixture. Aslo add tamarind pulp, salt, sugar and enough water to make the rasam thin. 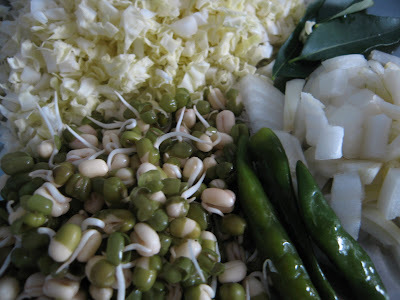 Once it starts boiling, add the chopped coriander and curry leaves, and little hing or asafoetida. Allow it to boil for 5 minutes and remove from flame. Serve with hot rice. 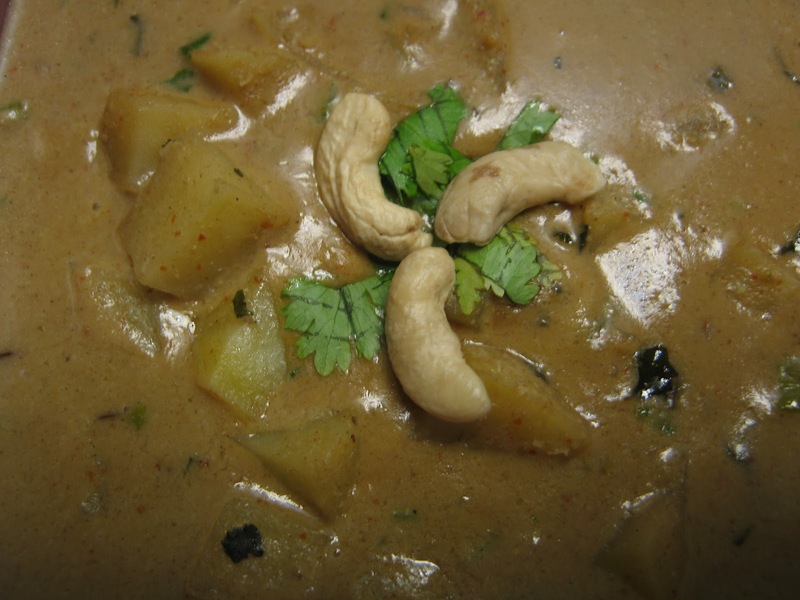 Paladya is one of the authentic curry recipes of Havyakas. It is prepared using the butter milk or sour curd. 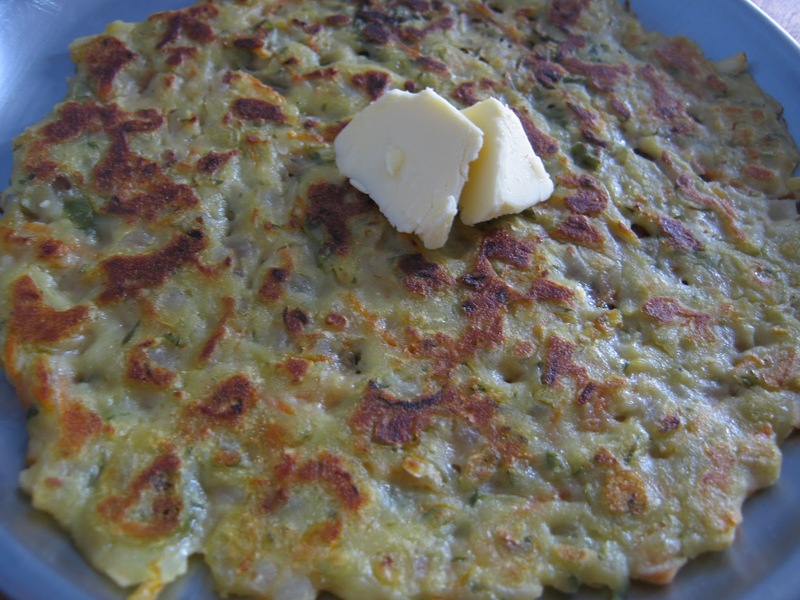 You can use okra, cucumber, dosakai (Yellow cucumber) or even potatoes for preparing this recipe. Wash the okras thoroughly, drain the water and wipe them with a dry cloth to remove all the water. Take around 2 cups of water in a vessel add salt, lemon squeeze as per your taste and allow it to boil by closing the lid. Cut the okra into slightly big pieces and keep aside. Grind the red chilly, green chillies, coriander seeds, mustard seeds, turmeric and 2 curry leaves with grated coconut into smooth paste by adding some water. Once the water starts boiling, add the okra pieces and cook for 5-6 minutes. If you are using the frozen okras, its enough if you cook them for only 2 minutes. When the okras are half-cooked, add the ground paste and some water-if required. Add few curry leaves and allow it to boil for another 2-3 minutes. Do the seasoning when it is still hot. 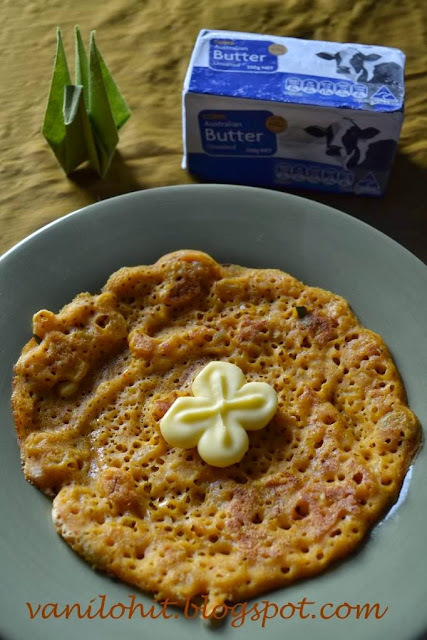 While serving, just add some butter milk to the warm Paladya and serve with rice. To start with, grate all the vegetables, finely chop the onion and chillies. Mix the above things with chopped curry leaves and salt. Then, add the rice flour and mix well. The dough should be bit watery only. Else, Rotti will become hard. If it looks dry, add little curd. Let it rest for 20 minutes and then, heat tava, put the batter directly on the tava and spread thinly with your hands into round rottis. 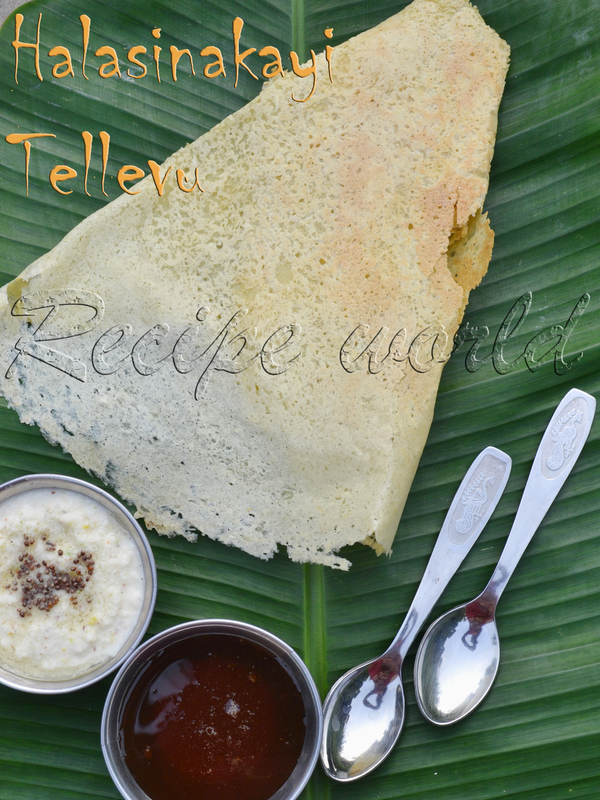 Else, you can prepare the rotti on the banana leaf and put it on the tava. Apply some butter or oil once you put it on the tava. When you see golden brown spots on both the sides, take it out and serve with butter. Akki Rotti will be even more tasty when you keep them on the tava for more time under medium / low heat. If you can get banana leaves, use them to pat the rottis. Banana leaves will add a nice aroma to the rottis and also, you can make the rottis more thin. 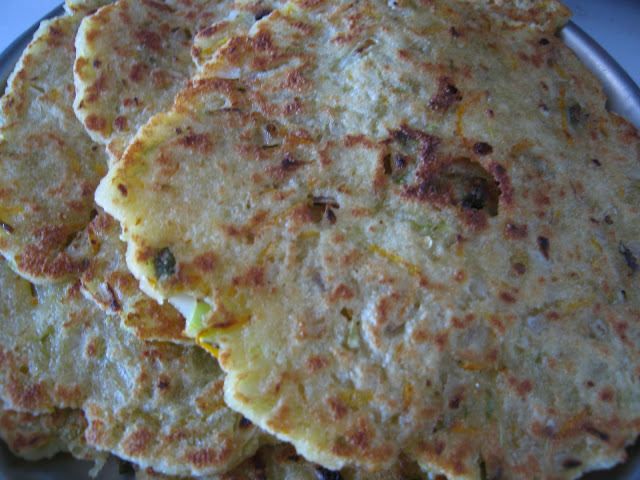 This Rava rotti is my all time favorite. It suits for breakfast, lunch and even for evening snacks. Courtesy for this recipe goes to my dear sister, who taught this recipe to me.. Some people call it by the name Kaayi Rotti, since Kaayi (coconut) is one of the main ingredients in this recipe. Mix semolina, grated vegetables, finely chopped onion and green chillies, curry leaves, grated coconut and salt in a mixing bowl into a dough. If required, add some curd and mix it well. Keep it closed for about 20 minutes. Take small quantities of dough, prepare balls and flatten them with your hands into rotis on a greased plastic sheet. Put the rava rotti on the heated tava and apply some oil on it. Once it is done on both the sides, take it out and serve with butter. Take all purp flour in a vessel, add 3-4 tsp of ghee and mix well. Then, add water little by little and prepare a smooth dough. Add some ghee to the rice flour, mix it well until it becomes very smooth and creamy. Prepare lemon size balls from the dough and roll like chapati. Take one chapati, apply the prepared cream on it evenly, then put another chapati upon it. Again, apply the cream and put one more chapati on it. 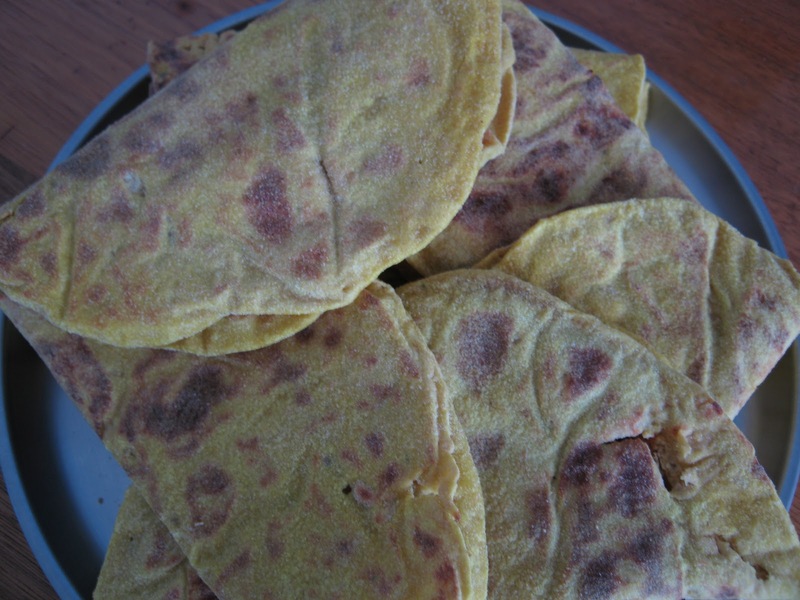 Put 3-4 chapatis like this and apply the creamy rice flour on each chapati. Then, roll these chapatis tightly into a single roll. Cut the roll into small pieces of equal size. Flatten the pieces a little and roll them like small Pooris . Heat oil in a pan and deep fry the rolled Chiroti under medium flame till it gets golden color. Drain the oil and then, sprinkle enough powdered sugar on both the sides. Now, Chiroti is ready to eat! I didn't prepare Chiroti after starting my blog. Let me upload the photos once I prepare them. Again, this is a Vah chef recipe. 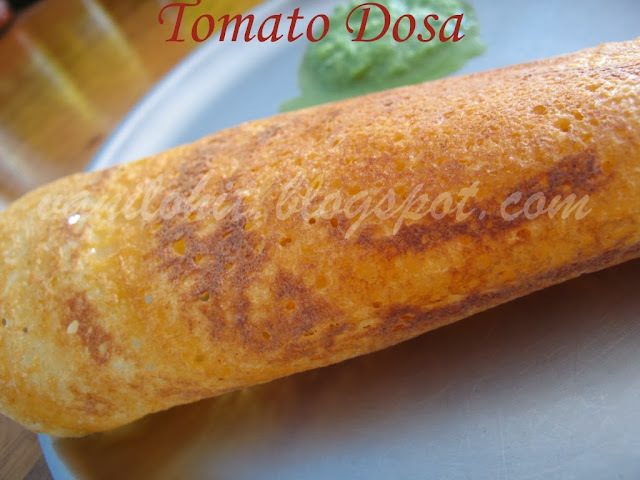 If you want to prepare dosas quickly, you can try this one. Damn easy to prepare and there is no compromise in taste. 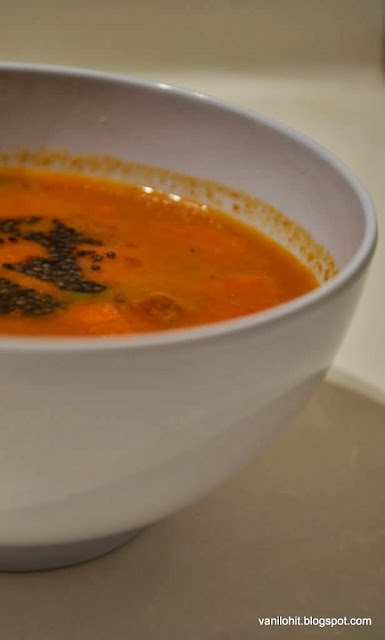 To view the video recipe from Vah chef, just click Here. 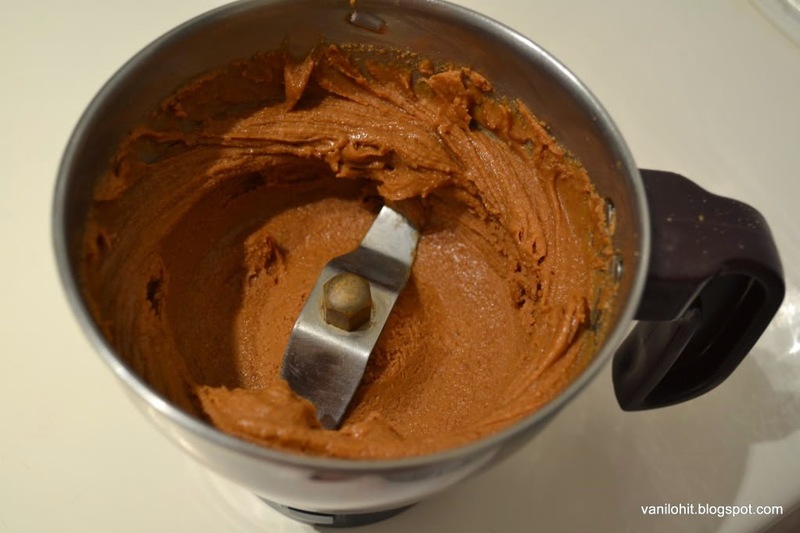 Mix all the ingredients in a vessel into a batter of very thin consistency by adding enough water. 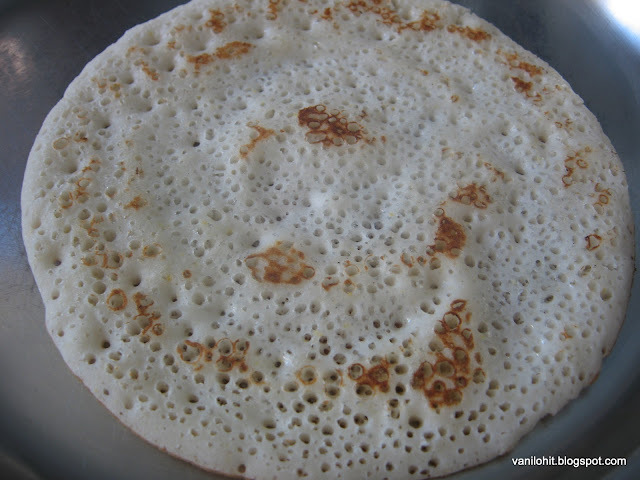 Heat the tava, pour the batter on the tava and prepare thin dosas. It should be very thin like Neer Dosa. 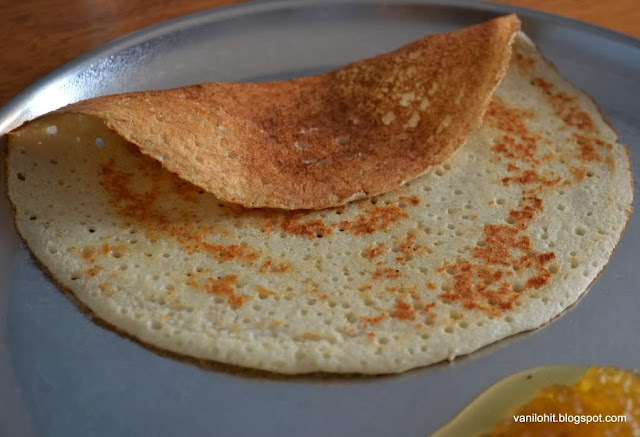 Enjoy these dosas with any chutney of your preference. Don't keep the batter for long time. Else, dosas will become very smooth. Hi all, here is a recipe which I learnt from my favorite cook Vah Chef. 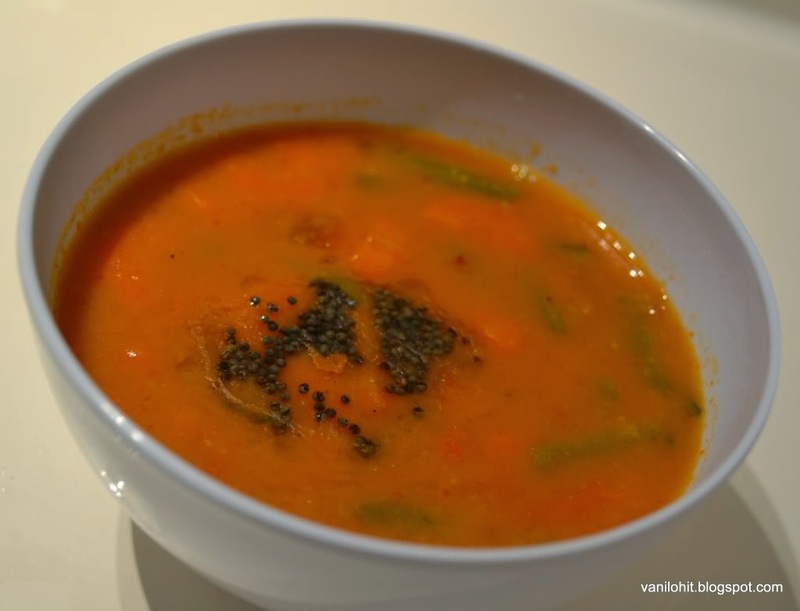 Click here to view the video recipe of Vah chef. Sieve the all purp. flour. Take around 1 cup of warm water, add yeast, sugar, salt and about a tea spoon of oil and mix it. You can add some milk or curd also. Add this mixture to all purp flour and prepare a very smooth, sticky dough. Add 2-3 spoon of oil to the dough and keep it closed for 15 - 20 minutes. Prepare lemon size balls from the dough by applying the dry flour to your hands. Keep the balls closed by a cloth so that so that they won't get dried. 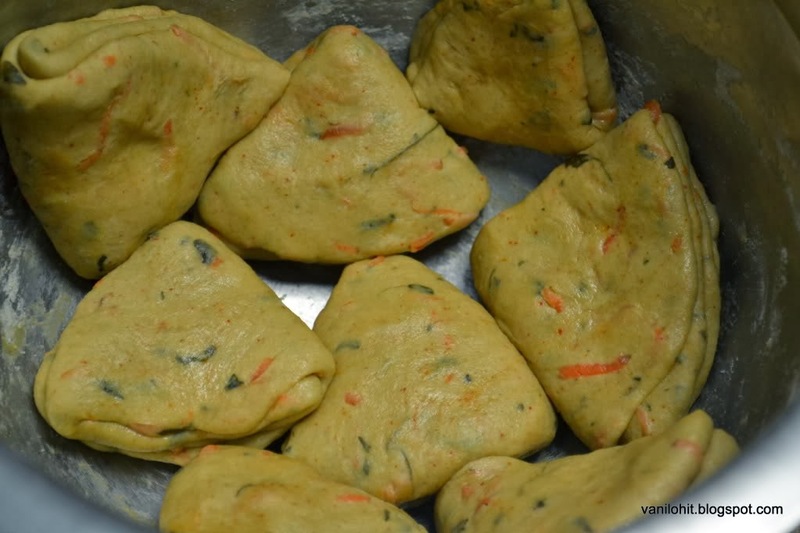 Take the balls of dough one by one, slowly press them with your hands and make it like a chapati by transferring them from one hand to the other. Preheat the oven to 450 C, keep the prepared naan on the greased baking tray and bake it for 2 minutes. Then, turn it and bake it for 30 -50 seconds. Take the naan out of oven, apply butter when its still hot, and serve with your choice of side dish! 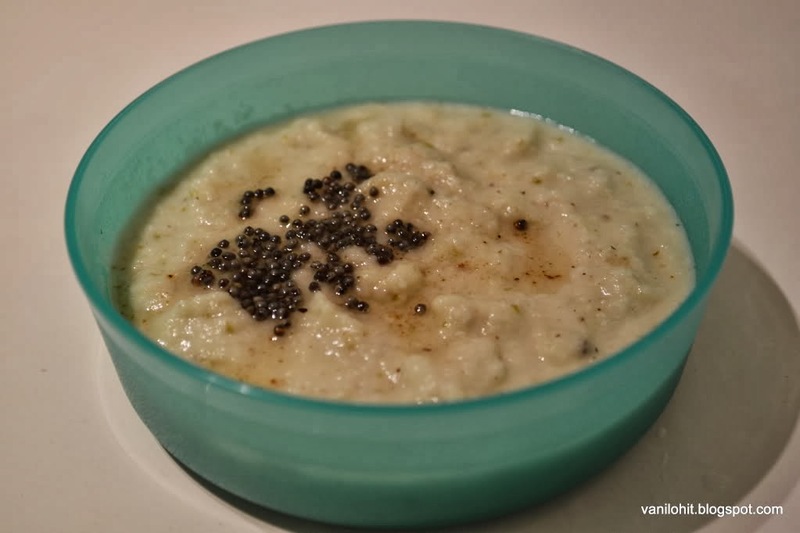 Here is a version of coconut chutney, where you can replace a portion of putani / split peas..If you are more cautious about cholesterol, you can go for this version! It goes well with Dosa, Roti, Parathas, etc. Heat 1 spoon of oil in a pan, add whole green chillies and fry it for about 2 minutes. Then, add ginger, coriander leaves, and curry leaves, fry them for a while and remove from flame. If you want to use less coconut, you can add split peas while frying the ingredients and can reduce the qty of coconut to 1/2 cup. Grind these fried items with grated coconut, tamarind and salt in a mixer by adding little water. Heat little oil in a pan, add mustard seeds. Once it starts spluttering, switch off the flame, and add the seasoning to the chutney.